If you’ve ever had a merchant cash advance, you’ll know that unlike a conventional business loan, a cash advance is much easier to obtain. There’s no need for tax returns, income statements, balance sheets, appraisals or collateral. You just simply need to supply an application and a few months bank statements, and within days (if not the same day) you can have funds wired directly into your business account. Obtaining a cash advance is the easy part; the hard part is the repayment. Ninety-five percent of cash advance require a daily repayment, either through ACH payment from the business bank account, or through a credit card split withholding. These daily repayments can cause a strain on the company’s cash-flow, and eventually lead the company into financial crisis. One way to help alleviate that cash crunch is to get a merchant cash advance with weekly or monthly payback options, rather than a daily remittance. In this article we will explore such options. But first…. Merchant cash advances are a way for a small business seeking immediate cash financing to essentially get paid early for payments that are going to happen between the next 1-24 months. A cash advance is the sale of a portion of a small business’s future revenue in return for a funding company providing funding at a discount. What this means is a merchant cash advance funder will purchase deposits that go through your company’s business bank accounts, or the business’s credit card processing transactions. After an agreement between the merchant and the cash advance funding company, the lender will wire a lump sum into the small company’s main operating bank account, and will then collect repayment by taking a portion of each day merchant credit card processing transactions, or by having a set amount deducted each day, week or month until the merchant cash advance is fully-repaid. What are Merchant Cash Advances Used For? 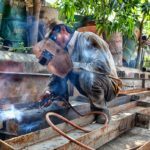 What are the Types of Merchant Cash Advances? ACH Cash Advance: After the funding company has wired the money into your business bank account, the cash advance company will then remit a set amount each day from the borrower’s bank account. Again, the amount that is remitted each day and sent to the funding company via Automated Clearing House is a set amount, with the exact same payment amount made daily, Monday through Friday, not including holidays. So, essentially, an ACH advance is repaid each business day until the loan is fully-repaid. That means with an ACH loan the borrower will know in advance exactly how many payments will be made, therefore they’ll be able to calculate the exact day the loan will be repaid. MCA Split: With a split withholding merchant cash advance there are a lot of similarities with an ACH advance. Like with an ACH, the funding company will wire funds directly into the company’s business bank accounts. But, as opposed to repayments being taken directly from the business’s bank account via Automated Clearing House, a MCA loan will, instead, split a portion of the company’s merchant credit card processing deposits with the borrower. This means that each day the business processes credit card transactions, a portion of those merchant transactions will be split with the funder until the funder is fully-repaid. On days when there are no credit card processing sales, the funder doesn’t collect payment. Since each day’s credit card sales are different, the amount repaid to the funder is different each day. Therefore, there isn’t an exact term with an MCA split. The term ends when the borrower completely repays, but there is no way of knowing an exact date the loan will be fully-paid before funding (although you can approximate). What are A Paper Cash Advances and B-F Paper? Merchant cash advance providers and merchant cash advance brokers generally rate the credit and cash-flow quality when underwriting a merchant loan. Business owners with good credit and whose company has quality cash-flow, strong business deposits, substantial daily balance in the business bank account, and are in an industry that funding companies don’t have restrictions on, will generally be offered the best rates on cash advances with the longest terms. In essence, the less risk you pose to the lender, the better the rates and terms. Borrowers who are able to qualify for the best types of merchant cash advances are qualifying for what is called “A Paper” or, the better rates and terms. Merchant cash advances with shorter terms and higher rates are generally considered “B-F Paper”. How To Get a Merchant Cash Advance With Weekly Repayments? Most importantly, the only cash advance company’s offering weekly repayments for a merchant cash advance are “A Paper” funding companies. If you’re a business with bad credit or with bank statements showing lots of overdrafts and insufficient funds, you’re generally not going to qualify for a merchant cash advance with a weekly repayment. But, if you are a company with strong deposits and daily balances, you could qualify for weekly repayments. Merchant funders that offer weekly repayments will only offer their advances in the 1st position, but some are willing to use the weekly cash advance to refinance a previous cash advance or to consolidate previous cash advances. A paper funders offering weekly advances won’t do additional positions at all. How Do Get Approved For a Merchant Cash Advance With Monthly Payments? Getting approved for a monthly merchant cash advance through a private lender is generally much more difficult than getting a weekly cash advance repayment, because the funding is underwriting using the company’s financials – not necessarily business bank statements. So in order to get a monthly repayment, you need to show profitability that is 150% of the amount you are seeking. And unlike with a daily or weekly merchant cash advance, the monthly repayment has a slower funding process than the faster funding cash advances, sometimes taking up to 3 weeks. 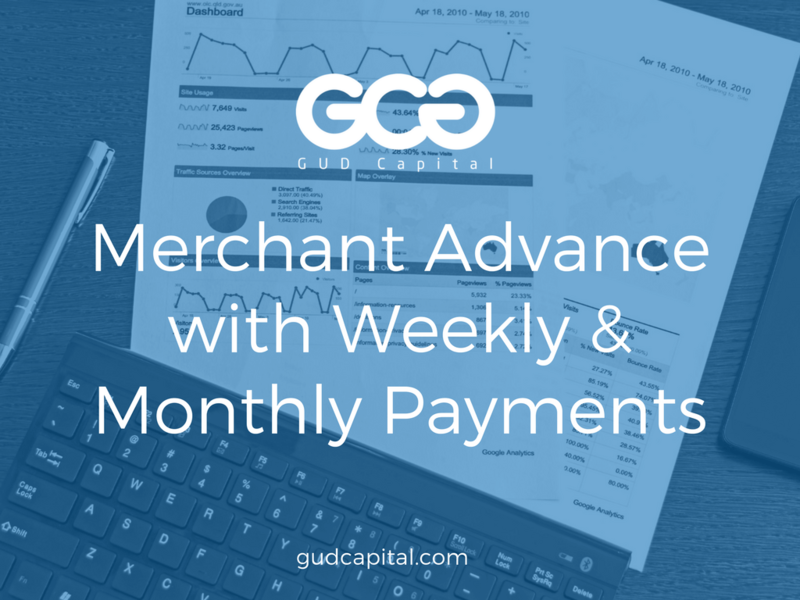 In short, if you want a merchant advance, but don’t want to deal with daily payments putting a strain on your receivables, you should certainly look into weekly and monthly repayment options. But understand that you will need to show good credit and quality cash-flow to obtain.